This badger was gifted to matt by the youtuber charlieissocoollike hence the name charlie the badger!! Then he can regenerate, so if he does die, it would be interesting to see how. I hope it's not that machine the woman used. Or maybe the next series doesn't involve The Doctor, he really does die and not come back, but instead we just have ganger Doctor who is exactly the same! That will haunt me while I sleep! Do 'gangers dream of synthetic sheep? Anyway, bad bad episode. Clones just looked ridiculous, and boss lady exists solely to be a ****, cause drama and ruin the Doctor's preferred 'everybody hold hands, form a drum circle and learn to love each other' resolution. And yeah, clone doctor was always going to happen. Also, this show has always liked to telegraph whatever moral lesson its teaching in a given week, but the whole 'ethics of cloning/all life in whatever form is pretty cool' thing was just beaten into the audience without mercy. Even when it tried to get serious - Jennifer's whole 'I'M ME, ME ME' rant- it was just absurd to the point of unintentional humour. I don't understand how Doctor Who can veer from excellent fare like the premiere two-parter and last week's episode into sub-Ed Wood garbage like this, I really don't. and I don't want Amy and the Doctor to have a baby or get together, because what about River Song? Unless Amy is River Song but Steven Moffatt already ruled that out. And isn't that eye patch lady meant to be the doctor's mother? So maybe the Doctor's mother is coming to visit Amy to make her pregnant with another Time Lord to carry on the Time Lord Race or something? And maybe the time lord daughter is actually River Song? But then the Doctor would have noticed River Song was a time lord. Eye patch lady is beginning to annoy me as we're just smacked in the face with her image without learning anything. probably going to get some hate for saying that. I'm impressed that one show can keep such a wide ranging audience (relatively) happy. aha I'm not saying it should be scarier I like it how it is I'm just saying I don't understand why some people talk about how scary it is. I enjoyed The Rebel Flesh as much as I usually enjoy the first part to a two parter (bar one or two exceptional first parts eg The Pandorica Opens and The Impossible Astronaut), which is that I got fully engrossed in the storyline, but I can't call it a Great episode, as I find it's almost always the second part to a story that makes it great or crap. Oh yeahm, and I saw the cliffhanger coming from the moment the doctor started playing with the flesh at the beginning. 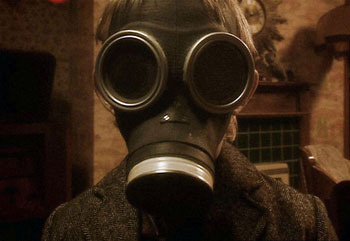 the gas mask children? not scary? EDIT: I'm curious. If we take the Pirate episode and The Rebel Flesh as the two 'low-points' of the series so far (gathered from general consensus on TSR)...I was just wondering whether people who disliked the latter episode liked the Pirate episode (and vice versa)? EDIT: I'm curious. If we take the Pirate episode and The Rebel Flesh as the two 'low-points' of the series...I was just wondering whether people who disliked the latter episode liked the Pirate episode (and vice versa)? I didn't really enjoy last night's episode...maybe next week's will be better. Roll on episode 7! Meh, the blueprint one I'm currently wearing is better.